Today's presentation of industrial partners of our Faculty was about mainframes. I have really looked forward to see it, because from time I hear how mainframes are superior to the ordinary computers, etc, so I wondered whether and why it was true. It was a total waste of time. Not only the speakers were not much experienced with presenting, but also the talk was almost information-free. For example, they described a typical set of components in a mainframe, which was a block diagram with parts which (as I understand it) have their equivalents in common PCs. They however did not tell us whether or how they are different. They also discussed which programming languages can be used for programming mainframes. Instead of showing a single slide with the list of languages, and maybe explicitly mentioning one or two most uncommon ones, they spent several minutes saying things like "We also support C++, which is the language deveoped in 199x, and it is object-oriented. We can use Java, which is also object-oriented, and on top of that it is interpreted.". And so on. The presentation also included plain lies, such as saying that the newest mainframe (released few months ago) with 1.5 TB of RAM and 64 quad-core CPUs is roughly equivalent to 1500 PCs: when compared to my new workstation I highly doubt that (if I compare the memory, I get the factor of 187.5, and for the number of cores I get 128; and I think the mainframe cores as well as the memory will be slower because of the HA/RAS features and looser coupling in the bigger system). Also the good old ignorance was there: they said that most of the Internet is running on the mainframes (whatever that means :-), and something along the lines of "I have tried to search what hardware Google uses - I didn't find it out but I bet they run on IBM mainframes". So the whole question whether mainframes are interesing and why should I use them remained unanswered. I really hope the next week it will be better - Dan Walsh of Red Hat will be presenting SELinux (Thursday 27th 14:00, FI MU, room D3 - you are invited to come). As you can read in comments (thanks! ), apparently Dan Walsh's talk on SELinux will be on Tuesday, April 1st, 12:00 instead. The BIOS can be upgraded from the BIOS itself, no need to create DOS boot floppy anymore - just put the ROM image to the USB flash stick and you are done! The BIOS is localized (I have tried to switch it to Japanese for the coolness factor :-). My first desktop computer without a floppy drive :-), I have a neat card reader instead. The memory controller can interleave the banks not only line-by-line, but also based on XOR of some higher order address bits (something like 10 to 14, IIRC), which allows multiple threads to use the independent memory channels. Huge (12 cm?) chassis fans, so the system is more quiet than the previous one, while providing good cooling to the disks. The case with the whole front side perforated for better cooling. Hardware virtualization support: I will finally be able to test other systems like some *BSDs and OpenSolaris. I had problems with the SATA controller in AHCI mode, solved fortunately by a BIOS upgrade. The graphics card (ATI X1650PRO) does not work in Zaphod mode (i.e. two separate screens, opposite to Xinerama/MergedFB/XRandR, which work). I have temporarily solved this by using an older card (X300 something). One of the Iva's favourite pastimes is that she thinks up a random word and asks me whether it does mean anything. Yesterday she asked: "What is JABOK?" "Does an elephant know all those names?" As I wrote before, last December I have taken a Japanese Language Proficiency Test (4-kyu) exam. Today I've got the results: I have fortunately passed with 348 points out of 400 (i.e. 87 %), which is not so bad. Now let's see whether I can manage to pass the 3-kyu this December. It means about 200 more Kanji and 700 more words learned, not counting things like grammar. So far I have found the following site with JLPT 3 resources. Unlike other sites, they at least have the Kanji and vocabulary in plain text form (and not Kanji images), so it is usable for importing into the learning software, etc. Also I have found a nice archive of images of Kanji stroke order (available as animated GIFs or still PNGs with all phases in one row), and it even has a relatively free license, so it is usable in the learning software without tricks like deep linking. For a long time I have been wondering how the so called "server-grade" hard disk drives differ from the consumer-grade hardware. I tend to think the difference is precisely zero, provided that the other specs (RPM and capacity) are the same. There is a well-known paper from Google researchers (PDF warning), which supports my opinion. For example, in our IBM FAStT-600 array with 28 250 GB SATA drives we have replaced about half of the drives, and from the consumer-grade 250 GB P-ATA drives in our other servers the failure rate is about the same. Last week we have replaced our backup server by a new hardware with newer and bigger drives, and I have looked at the old server whether some of the drives would still be usable: I have found two 250 GB P-ATA drives which both had zero errors logged in the SMART log, and both had over 36,000 hours of usage (4 years and 1.5 month)! I remember they were previously installed in Odysseus (aka ftp.linux.cz), where they were almost continuously busy for at least a year and half. So the next time some salesdroid would try to persuade you about the different firmware and higher manufacturing standards of the "server-grade" drives, do not buy the snake oil! 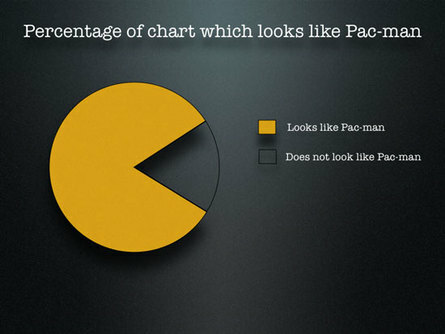 Seen at Slashdot, the source URL is http://www.presentationzen.com/presentationzen/images/2007/03/16/pacman.jpg. The first problem is with typesetting the C source code (quite frequent task for the UNIX course): I cannot use the [fragile] option to the frame environment, because it writes the text to the file and rereads it again, messing up the character encoding during the process (I use UTF-8 input encoding). I cannot use the semiverbatim environment, because the most tricky part - the indentation of the source code - is not preserved. The second problem is with graphs and diagrams: I want them to have the same font as the surrounding text (both in typeface and size). So the file format should be something like LaTeX (for texts) + something for rectangles, lines, arrows, and other vector graphics. I have tried about all the formats XFig supports, but none of them work with PDFLaTeX, UTF-8 encoding, and meets the above requirements. So, my dear lazyweb, how would you solve the above two problems (other than using OOImpress or something similar)?